BSc, Life Sciences, Queens University, Kingston, Ontario. BPHE, Physical and Health Education, Queen’s University, Kingston, Ontario. Naturopathic Doctor, Canadian College of Naturopathic Medicine, Toronto, Ontario. 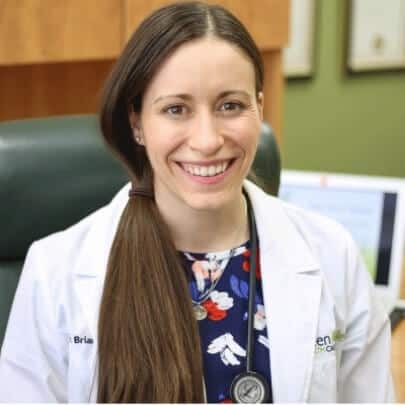 Dr. Briana Botsford is an experienced naturopathic doctor who knows that one of the most important parts of medical care is not only listening to the patient, but also hearing them. She knows the impact that health conditions can have on a patient’s life, and knows she can help to improve these conditions through natural medicine. In addition to her extensive pre-med training at Queens University followed by four years of intensive study at the Canadian College of Naturopathic Medicine, she earned a certificate as a Certified Strength and Conditioning Specialist and Yoga Teacher. She routinely integrates her in-depth knowledge of movement and exercise into her patients’ treatment plans. Dr. Botsford has also received advanced training in emergency procedures, IV therapy, prolotherapy, neural therapy and ozone administration. Her focus areas are the treatment of mental health issues such as depression and anxiety, digestive concerns including irritable bowel syndrome and inflammatory bowel disease, and women’s health issues such as menopause, fertility and PMS. She has thorough knowledge of nutrition and even grows her own fruits and vegetables in a massive six-acre yard on her farm. Additionally, an Ironman Triathlete, Dr. Botsford has advanced education in sports medicine and the treatment of pain and injury as well as sports nutrition and performance, areas of special interest to her. Dr. Botsford has helped patients improve their mood and reduce anxiety. She has worked with patients to bring down their blood sugar and cholesterol. She has helped patients sleep better and have more energy. She has worked with women struggling with painful or irregular menstruation, infertility or hot flashes and helped them find hormonal balance. Using both basic and advanced naturopathic therapies she will work with you to determine the best treatment plan based on the cause of your issues. Dr. Botsford has helped many people feel better, and she would like to help you too. She wants to work with you to get you feeling well!